If you get bored with your PC desktop then its right time to use Bump top. Bump Top is a software which customize your PC desktop into 3- Dimensional view rather 2- dimensional. This software turns your PC desktop in to the form as in rooms with wall-floor and walls. Moreover, You can put the desktop icon on floor of the room as well as walls. You can also put the sticky note, and also the image slide show. If you are not satisfy with the view, then you can rotate the desktop walls by making Double click on any wall on the desktop and if you want to get back to the previous view then just Double click on the floor of the room. You can also group the desktop icon in to the form of stack.If the stack icon is double-click on the stack this will expand in and you can choose which program or file that will be executed. If you want to make quick grouping of desktop icon, Bump Top provide grouping based facility with the right-click and select the pile by Type. Now, with this property, you can move the complete group of desktop to the area you want, including zoom in and zoom out appearance. You can also put the photos from your PC as well from online services like Flickr and Picassa. same facility is also applicable for sticky notes. There are some default desktop icon including New Email, Facebook and Twitter. 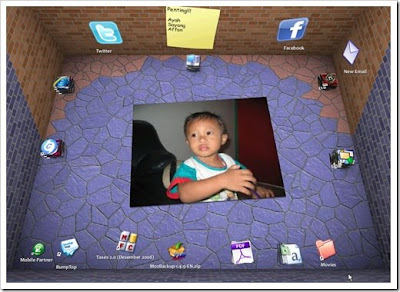 You can also customize your desktop by choosing different themes from Bump Top theme Customize.org. Just download the theme from the above link and put the folder into C: \ Documents and Settings \ \ Application Data \ bump Technologies, Inc. \ Bump Top \ Themes later on, so this theme will be included in the list of options on the Settings Bump Top theme. The Bump Top comes in 2 different versions- Free and paid version, but free version comes with some limitations. How often have you looked at something and thought, “I really wish I could afford that.” It happens to all of us, more frequently than we wish it would. Most of us find that we lust after those beautiful handbags that we see the celebrities toting around, but we believe that it is not possible to afford such beautiful bags without robbing a bank. If you choose exact replica designer handbags, it is absolutely possible to be able to afford those bags without much difficulty at all! Exact replica designer handbags are made out of the finest materials and are made exactly the same way that the pricy bags are made, only they come at a much lower price tag. There are a number of exact replica designer handbags that are ideal for people who are looking to own a designer handbag but who do not want to pay the ridiculously high price tag that comes along with a designer handbag. The Slouchy Tribal Bag in black is a great bag that has caught a lot of attention lately. This Louis Vuitton handbag features a unique and trendy design, with an easily affordable price tag. One name that brings to mind glamour and the absolute best in design is Prada. Many women find that they are almost purring the name whenever they say it. Unfortunately Prada is also extremely expensive, and most women believe that only the filthy rich can afford it. If you’d like to have a Prada handbag, it is absolutely possible. Exact replica designer handbags can be found for Prada handbags and are extremely affordable, giving you the opportunity to feel rich and fabulous yourself, without breaking your bank! The Prada Naplack Milano Shopper in brown is a beautiful exact replica designer handbag that looks and feels exactly like the real thing. Because the product looks like the real thing, no one will know that it isn’t. These designer handbags are made using the same materials that the originals are made from, which means that they not only look as great but last just as long. This black Milano backpack is ideal for a casual day or for a work day, especially if you are wearing business attire. You can, however, mix it together with brighter clothes as well, as the dark brown goes with almost any outfit you can mix it with.